PRODUCTIONS LIKE Breaking Bad have firmly established Albuquerque as an important extension of Hollywood, but on the national scene, the Duke City’s theater community is still seen as a scrappy outsider. Its turn in the spotlight may be overdue. Hollywood actors are increasingly honing their skills in local productions, and a number of household names, including Neil Patrick Harris and Jesse Tyler Ferguson, began their careers on Albuquerque stages. Theater insiders universally praise the diversity of Albuquerque’s offerings, with productions ranging from avant-garde black-box performances to elaborate mainstream musicals. The Albuquerque Theatre Guild, an umbrella group of companies and venues, comprises more than 40 organizations—an impressive number for a city of just more than half a million residents. Meet the leading players. Like Mickey Rooney’s and Judy Garland’s characters in Babes in Arms, the Adobe Theater’s founders had a simple, earnest goal: “Let’s put on a show!” Established in 1957, the community theater moved to Albuquerque’s North Valley in 1995, where it adopted a 90-seat venue with a thrust-style stage, in which the audience’s seats wrap around the performance space. The theater offers a balanced season, with productions ranging from Arthur Miller’s All My Sons to relatively new musicals like The Drowsy Chaperone—each with fresh directors and cast via open call. Although the Adobe keeps productions conservative to satisfy its mature audiences, it gambles on untested scripts by local playwrights, including, in past seasons, W.G. Allen’s Lost Letter and The Men of Mah Jongg by Richard Atkins. Founded in 1930, this 500-seat community theater is both a venue and a production company, casting and staging seven shows a year at its home south of Old Town in a WPA building designed by the famed New Mexico architect John Gaw Meem. Founding member Vivian Vance, famous for her role as Ethel Mertz on I Love Lucy, performed in the theater’s first show. Don Knotts, Bill Daily, and Maureen O’Sullivan also performed on its proscenium stage. This downtown space is home to Fusion Theatre Company, Albuquerque’s only theater troupe affiliated with Actors’ Equity Association, the professional stage union. Six to eight locals make up the company core; SAG actors drawn to New Mexico by its film and TV boom often complete the casts. Even professionals have their chops tested in the company’s venue, the Cell. It’s an intimate, 70-seat black box, where audience members can quickly sniff out inauthenticity, says executive director Dennis Gromelski. Founded in 2001, the nonprofit Fusion has received funding from the Shubert Foundation, a New York–based group affiliated with theaters on Broadway. Fusion’s bona fides have enabled it to source shows from that hallowed theater district; it presented Vanya and Sonia and Masha and Spike, by Christopher Durang, just 10 days after it closed on Broadway. Fusion did similar runs with plays such as Doubt and August: Osage County. Although the company’s plays premiere at the Cell, it also performs in Gallup, Las Cruces, Santa Fe, and elsewhere in New Mexico. Spontaneous song and dance is always on the verge of breaking out at MTS, founded in the 1960s as Civic Light Opera. This institution’s cohort considers itself a family; star offspring include Jesse Tyler Ferguson, best known for his role on TV’s Modern Family, and Neil Patrick Harris, who has hosted the Tony Awards and this year won one of his own for Best Performance by an Actor in a Leading Role, for Hedwig and the Angry Inch. MTS scales former Broadway favorites, including this summer’s production of Titanic, in a 100-seat black-box space that was established after a 2010 fire devastated the company’s former home, along with 50 years’ worth of sets and costume archives. At times serious, at others whimsical, just like the impish Puck—whom audiences might know from the company’s Shakespeare on the Plaza summer festival—the Vortex keeps audiences guessing. A venue for both classic and cutting-edge theater since 1976, the Vortex’s latest surprise is a dramatic one: This summer, it relocated to the Northeast Heights, where it enjoys a 100-seat theater, rehearsal space, and abundant parking. The organization, which does not have a standing company, opened its new space last month with Picasso at the Lapin Agile, a play by Steve Martin, and from October 10 to November 1 will perform The Mystery of Irma Vep, by Charles Ludlam, a major figure in the Theatre of the Ridiculous movement. This downtown space is the dominion of Tricklock, a dozen-member resident company known for developing its productions from idea to script to performance. The process can take months, sometimes years. Juli Hendren, a co–artistic director who co-founded Tricklock two decades ago, says, “We’re an incredibly passionate group— partly because we’re a physical theater company. Everyone’s a bit of a weirdo, but in a good way.” Once an idea takes shape, the troupe performs the finished play in Albuquerque before taking it to such remote audiences as the Canadian fringe-festival circuit. Meeting like-minded creators on these far-flung tours inspired Tricklock to start the Duke City–based Revolutions International Theatre Festival, which has played host to puppeteers from Israel, clowns from Italy, dancers from Armenia, and storytellers from Great Britain. 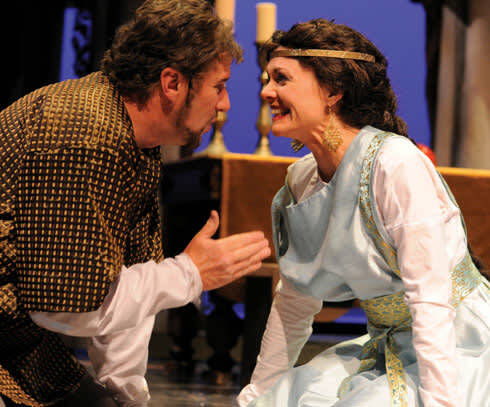 Photo Caption: Rick Huff and Erin Warden share a brief, shining moment as Arthur and Guinevere in Musical Theatre Southwest’s production of Camelot.